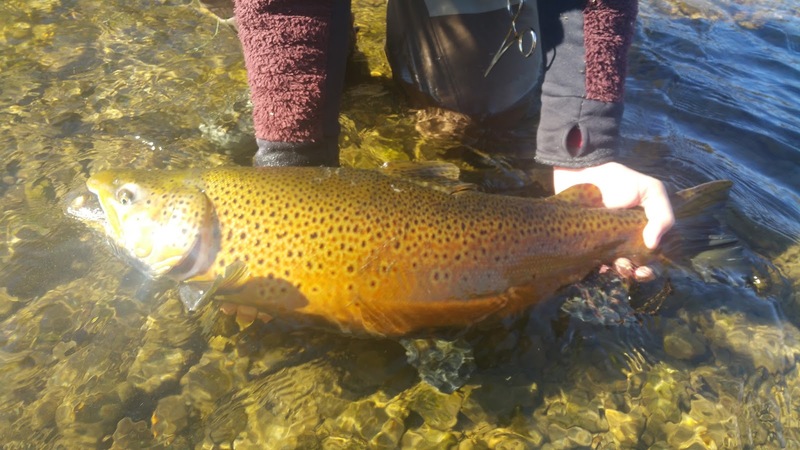 The drought that dominated the upper east coast during the latter part of the Summer of 2016 didn't cease with the first few good fall rains - no, this monster lingered - unveiling an even uglier face in poor fish returns on many of our beloved waterways. The king salmon ran in Pulaski in quality numbers for three weeks in October, despite the pathetic 185 cfs flow. For those unfamiliar with the Salmon River, flows north of 500cfs and up to 1200cfs are considered prime and are the norm for fall steelhead season. Much to our delight, a torrential rain storm pushed through the region in the end of October – depositing nearly 5 inches of rain in watershed. While I dawned my Walking Dead costume and headed into the warm Halloween night to collect my yearly supply of Kit Kats and mini Snickers bars, the Salmon swelled. With flows exceeding 2000 cfs, I couldn’t help but imagine the river teeming with silver bullets for our first steelhead trip slated for mid November. Fishing was very slow today, anglers reporting at most 2 hook-ups, mostly steelhead. No end of the run seemed to be doing particularly better than the other. 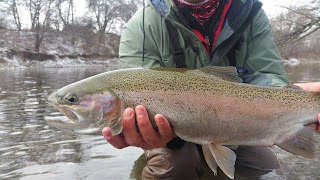 Still not seeing the numbers of steelhead we are used to for this time of year. 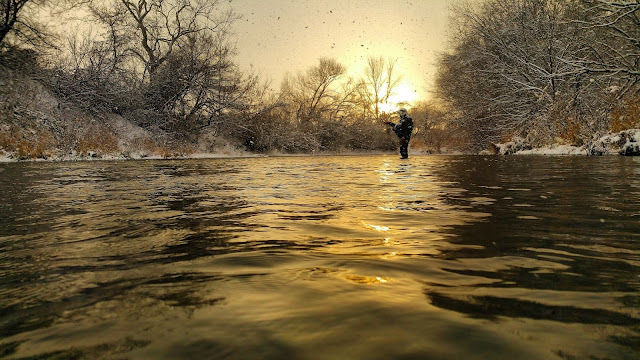 Some anglers are able to get into a fish or two, but that's for a good hard day of fishing; covering lots of water. With our sights set, Steelie Zan and I packed the Steele Train with our fishing totes and rode west to meet a man who knows a thing or two about meat - "The Steele Creel" - Gavin. The three of us rigged our gear over a dozen Utica Clubs and engaged in a “Let’s show these folks how to catch steelhead tomorrow boys” powwow before we turned in. 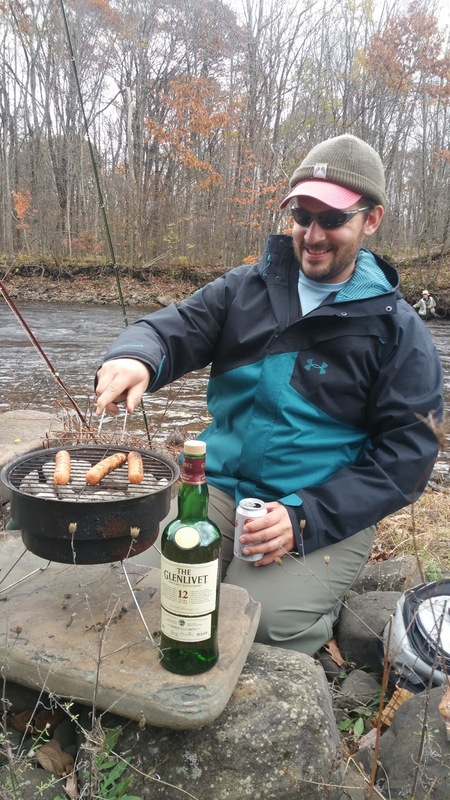 Gavin grilling some "soggies" while enjoying some scotch. Like harden steelheaders we charged onto that river only to find that the fish didn’t really show up. 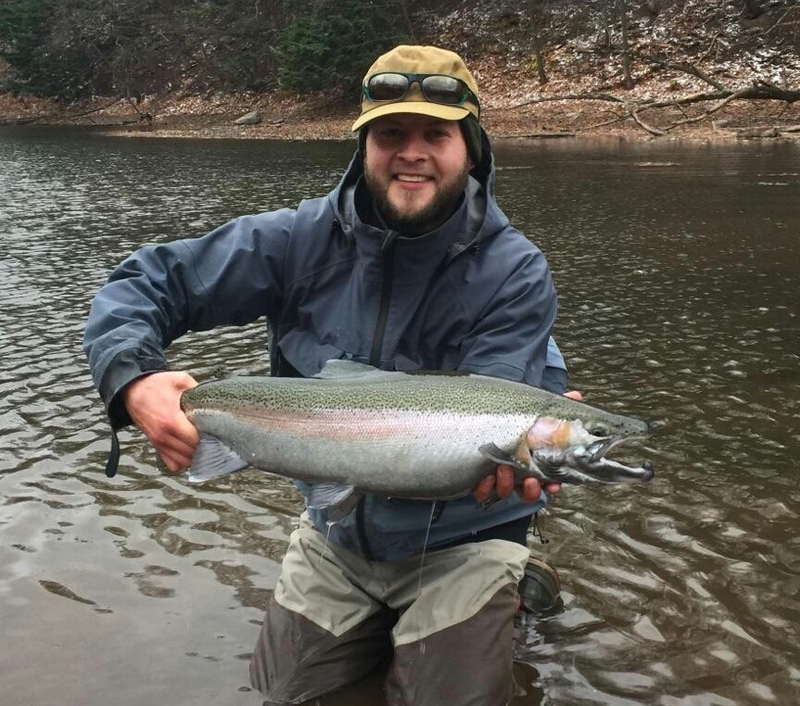 Two steelhead (2lb, 4lb) and 4 brown trout (~10 inches) for over 80 hours on the water pretty well sums up the weekend. To provide context, the Salmon unusually produces 5-15 hookups per angler per day in November, with days of 30 hookups not out of the question. Plain and simple - it sucked. On our last afternoon, we shot over to the North Sandy Creek where Steelie Zan salvaged the trip with a beautiful fall male brown. That fish took the sting out of the punch, but the NY tribs had hit us hard and there would be bruising. On the plus side, Gavin had made arrangements for us to purchase a quarter cow from a beef maestro in Ithaca, things were looking up. Steelie Zan and I began to plan out our return for 2 weeks later. This time 4 days, 2 on the Salmon on and 2 on a the tributaries west of Rochester on waterways we were far less familiar. Day 1 back on the Salmon – 20 hours on the water, 0 fished landed, 0 fish hooked, 1 fished seen. At days end, we both knew it, we had enough of the Salmon River. Plan B was in full effect, with Pulaski in the rear view, our sights lay on Brockport. This turned out to be a very fortuitous move, as the 65 degree day we enjoyed on the Salmon on Saturday, gave way to 2 feet of snow on Sunday and another foot on Monday. If Pulaski is the former high school prom queen 10 years past her prime, addicted to meth, living in Myrtle Beach pursuing a prostitution career, then Brockport is her younger kin – wise from watching her sister's mistakes, settled on the Erie canal, married with 2 kids, helps run the Country Max feed store with her husband while picking up extra hours at the front desk of Hampton Inn and waitressing at the Golden Eagle dinner. Life isn’t glamorous but it’s one hell of an improvement. Sunday was cold and windy. We saw one brown and we were lucky to get an eat. We also had a nice chat with DEC while exiting the river in near total darkness while enduring 30 mph cross winds and snow. From what I have heard, and experienced, this was quite a treat. In my 8 years fishing in upstate NY I have seen a DEC officer once. A guide friend of mine, who guides the Sandy, the very river we were on, has never seen one. The experience was pleasant aside from a beer can falling out of one of our pockets while trying to produce a NY fishing license and the younger DEC officer examining it with his Maglite while we stood in awkward conversation. The next 2 days proved more enjoyable, both in weather and in angling. 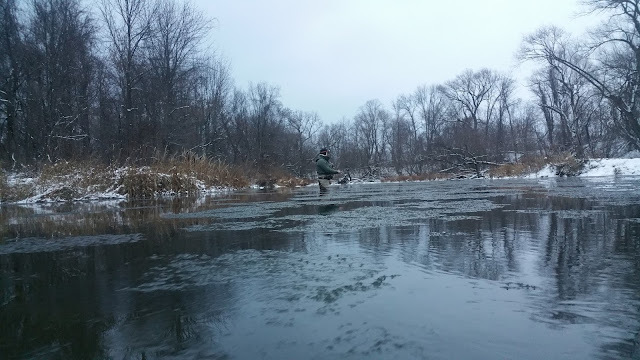 We found a few willing fish on the Sandy creek and then when things slowed there, we worked our way over to the Oak Orchard. It was from the Oak, where we tasted our first and only steele of the trip, a healthy buck. 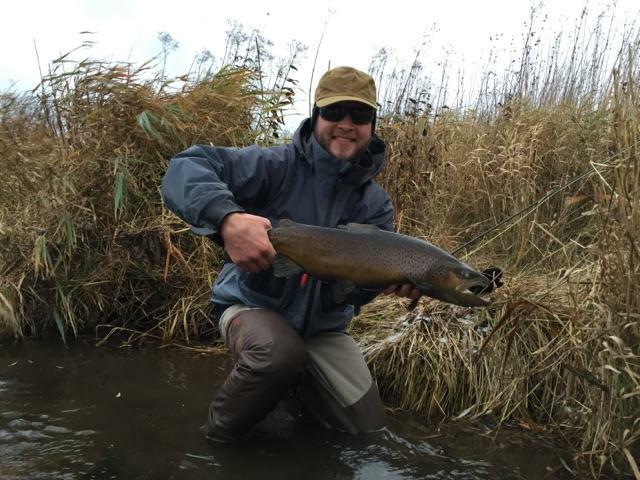 With a handful of rainbows and browns added to the mix, we started to settle into this fishery. 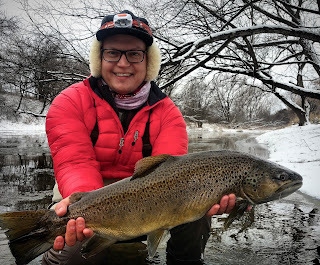 Another 2 weeks back at the grind and we found ourselves in mid-December - again the fishing itch returned and with a favorable forecast, we conspired once again. This time, we were driving right past the Salmon. Steelie Zan battling the slush just moments before taking a nice fish on the streamer. Over those 4 days, we log our time on the Sandy. Life was like a fine buffet, we would angle a section for a while, have our fill and try something new, finding ourselves returning for seconds and even thirds. The Oak proved to be a dish was not worth sampling. On our brief trip to the Oak during day 3, a gentleman of "25 years experience", told us that he had hooked “nothing”, although the day before had been “OK, with 3 fish landed”. We settled in next to a group of guys who remarked “the fishing has sucked”. 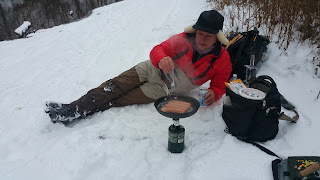 We decided to take lunch, breaking out the single burner grill, cooking up some hot dogs, drinking a beer and enjoying just sitting on the river. After an hour of fishing with little encouraging sign, we decided to head back to the peaceful banks of the Sandy. There, the pressure was low and there were fish to be had. 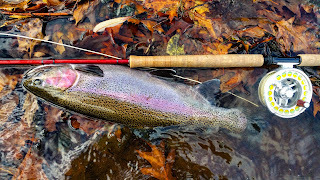 We rounded out the weekend with 15+ browns and a handful of rainbows to the bank on streamers and egg patters. While the Salmon is considerably closer, it was quite nice to get out and explore some new water on tributaries where we have had limited exposure. 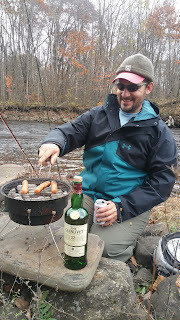 It is safe to say that if the Salmon were fishing well, then we wouldn’t have spent 7 days on Oak and the Sandy in the fall of 2016 - an experience, I very much enjoyed. 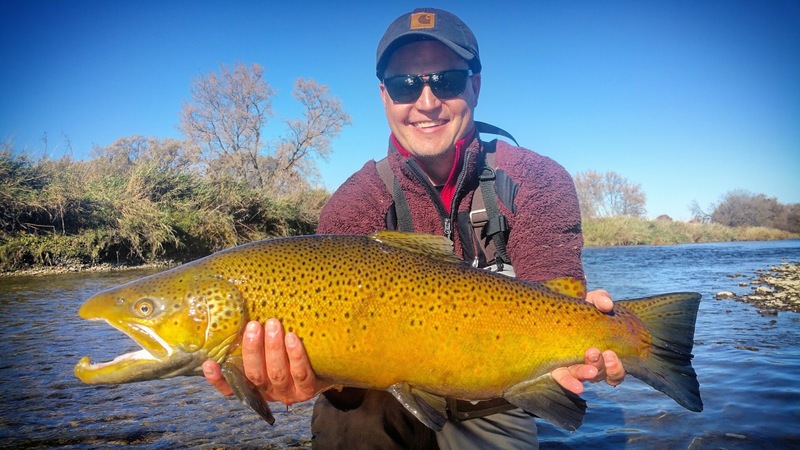 So next time your favorite waterway fishes poorly, peer into your fly box, look for that silver lining and imagine the opportunities on a new waterway near you. Well done gentlemen. Some impressive specimens there. A great read, Clarka! I loved your SR - Brockton comparison. Very effective.